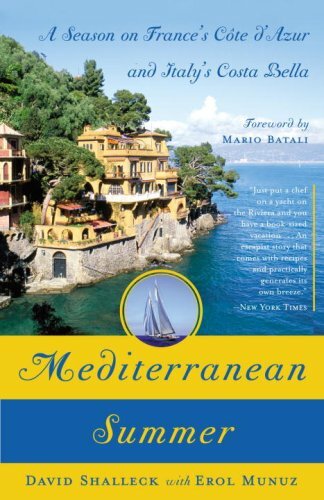 An alluring, evocative summer voyage on the Mediterranean and into the enchanting seaside towns of France and Italy by a young American chef aboard an Italian billionaire couple’s spectacular sailing yacht. Having begun his cooking career in some of New York’s and San Francisco’s best restaurants, David Shalleck undertakes a European culinary adventure, a quest to discover what it really means to be a chef through a series of demanding internships in Provence and throughout Italy. After four years, as he debates whether it is finally time to return stateside and pursue something more permanent, he stumbles upon a rare opportunity: to become the chef on board Serenity, the classic sailing yacht owned by one of Italy’s most prominent couples. They present Shalleck with the ultimate challenge: to prepare all the meals for them and their guests for the summer, with no repeats, comprised exclusively of local ingredients that reflect the flavors of each port, presented flawlessly to the couple’s uncompromising taste—all from the confines of the yacht’s small galley while at sea. Shalleck invites readers to experience both place and food on Serenity’s five-month journey. He prepares the simple classics of Provençal cooking in the French Riviera, forages for delicate frutti di mare in Liguria to make crudo, finds the freshest fish along the Tuscan coast for cacciucco, embraces the season of sun-drenched tomatoes for acqua pazza in the Amalfi Coast, and crosses the Bay of Naples to serve decadent dark chocolate-almond cake at the Isle of Capri. Shalleck captures the distinctive sights, sounds, and unique character of each port, the work hard/play hard life of being a crew member, and the challenges of producing world-class cuisine for the stylish and demanding owners and their guests.